Home Education Why does TMJ cause headaches? Why does TMJ cause headaches? In a previous blog I discussed how TMJ can mimic tension type, sinus type headaches and migraines. We all understand the concept of referred pain. For example when you have a toothache in an upper back tooth it could present as pain in the sinus that is located directly above its roots. In this case the pain is felt in the two different structures because the sensation is supplied by the same nerve branch. Using this principle it is important to understand that the extension of the brain into the body to control pretty much everything is via cranial nerves. Of these the biggest is the Trigeminal nerve and it is estimated to provide 50% of the input into the brain. This nerve has 3 branches that supply the entire head and face region. If there is a pain signal or other irritating signal in one of the branches it can also be perceived as pain from the other branches. Therefore pain in the TMJ for example can also cause referred headache / sinus pain. To add to this complexity there is structure called the Trigeminal Cervical Complex which is where nerves that carry sensation from the back of the head (occipital), neck and shoulder muscles join the Trigeminal nerve and then join the same nerve root before being processed in the brain. So a problem in the TMJ could cause refereedneck and occipital pain. Conversely a problem in the neck could be perceived as face pain. 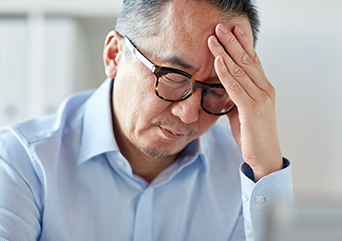 The latest research shows that Migraines occur due to activation of the trigeminovascular system (TGVS) which consists of the trigeminal nerve and nerve fibers which innervate blood vessels inside and outside the brain. Head Pain occurs when these blood vessels dilate following release of a ‘soup’ of neurochemicals due to activation of the TGVS. This ‘soup’ of neurochemical also causes inflammation. Activation of the TGVS can occur due to stimulation of the nerve endings of the trigeminal nerve. The trigeminal nerve endings are located in the cranium, face, teeth, jaws, jaw joints and face/jaw muscles. Therefore painful stimulation from any of these areas can cause activation of the TGVS and ultimately migraines. 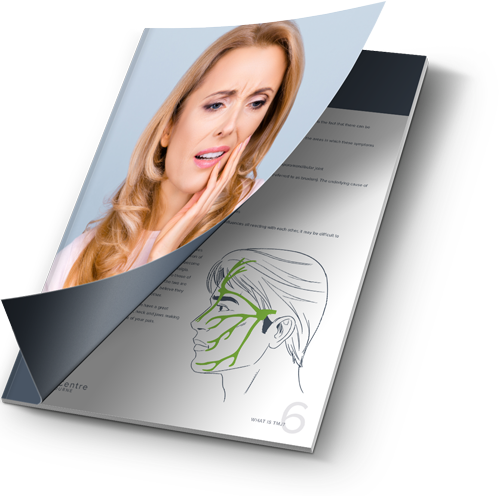 I am not saying that TMJ / TMD is the cause of all migraines but it can certainly contribute to severity and frequency. Indeed I have seen many patients have resolution of their migraines following suitable treatment. The research also confirms that when TMJ/TMD and comorbid migraines are present the best outcome is obtained when both occlusal splints and medication is use. When there is inflammation in the TMJ, often one side is worse than the other. The body automatically adapts a forward head posture as a way of reducing the pressure on the TMJs. As we are all aware forward head posture causes a tremendous increase in tension on the neck and shoulder muscles which can lead to increased pain in the occipital regions and trigger points that can refer to the frontal and temple regions as well as head pain due the neuroanatomy discussed above. Other conditions that can cause forward head posture are chronic mouth breathing, prolonged use of mobiles, lap tops etc, poor work ergonomics and sacroiliac dysfucntion. Actions such as chewing , clenching and grinding are not just done by the jaw muscles. There is a considerable coordination required with the neck and jaw muscles to carry out these activities. So when we clench / grind we also “ clench” with our neck muscles, which leads to the increased fatigue, pain and trigger points mentioned above. I am no expert on central sensitisation but it is important to comment on this process involved in pain. When an acute pain situation is not dealt with by the body, a process termed peripheral sensitisation occurs. Simply but this process up regulates the pain signals form the localised region instead of down regulation by recruitment of extra nerve endings and faster nerves to transmit the pain signal to the brain. The peripheral sensitisation can lead to central sensitisation, particularly when the Trigeminal nerve is involved due to its importance to the brain. This over excited nervous system will then relay even usually non painful pain signals as very painful, so conditions such allodynia and hyperalgesia can occur. Further more because of the neuroanatomy involving trigeminocervical complex as well as the vagus nerve (which supplies the organs) joining the trigeminal nerve non painful stimulus can present as painful stimulus in other areas of the body. This central sensitisation is involved in a variety of conditions such as migraine, GERD, fibromyalgia, and irritable bowel syndrome.